Karin H. Bauer is an angel investor and advisor to technology start up leadership teams (Dashboard Earth, FEM Inc., FuelX, Vaute Couture) in the areas of strategic partnerships and conscious business practices, utilizing her experience in marketing and international business development, sustainable leadership, and stakeholder engagement. Karin has twenty years of experience in senior technology marketing and international business development roles, most notably at eBay, Broderbund Software, the 3DO Company, and Oracle Corporation. She has also held marketing and strategic partner management positions at SRI International and GMFanuc Robotics in Dusseldorf, Germany. 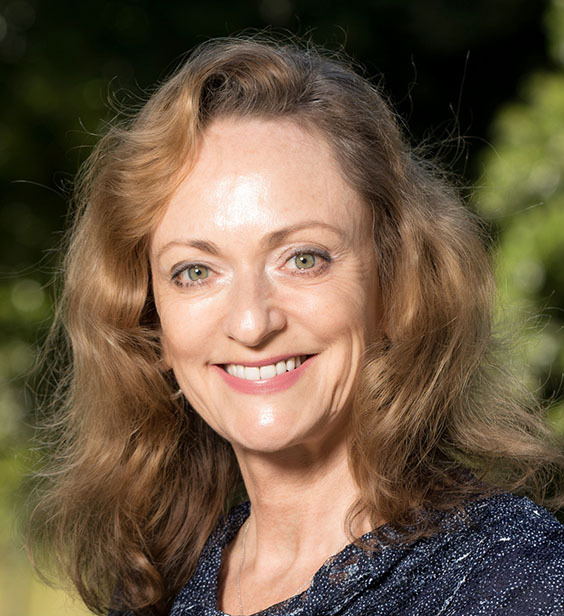 Karin earned a doctorate in Philosophy and Religion with a concentration in Asian Comparative Studies at the California Institute of Integral Studies in San Francisco, California in December 2016. Her dissertation was on Interconnectedness in Vedic and Buddhist Thought and Implications for Stakeholder Theory. She also holds an MBA from the University of California, Berkeley Haas School of Business (1994) and a BA in International Relations from Pomona College (1984). Karin’s philanthropic engagement is extensive. She is a founding board member of The Philanthropy Workshop, an active network of social impact philanthropists, and a member of Battery Powered. She is board chair emeritus of WiserEarth, founded by Paul Hawken. She has been an investor and advisor to the Acumen Fund, Dasra-Social Impact International, the Global Social Venture Competition at UC Berkeley, and the Maddox Jolie-Pitt (MJP) Asia Foundation. She completed six years’ service on the Commonwealth Club’s Board of Governors. She is a trustee emeritus of the American Conservatory Theater based in San Francisco. She recently joined the Founding Advisory Council of the Berkeley-Haas Center for Gender, Equity and Leadership (CGEL). Karin is fluent in German and French, has studied Sanskrit, Italian and Russian, loves yoga and sailing, and enjoys international travel, especially to India and Europe. She resides in San Francisco with her Collie, Geordie, and five rambunctious cats: Felix, Sterling, Elsa, Willie, and Francis.